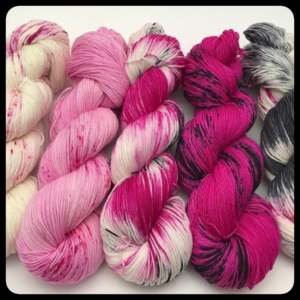 So why am I choosing to use only indie dyers? The short answer is – because they are awesome! 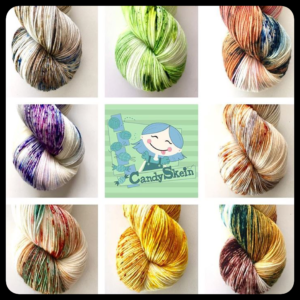 In truth, I’m just really inspired by the color combinations and techniques that indie yarn dyers create. I also really love supporting small businesses. All of the indie dyers I am working with are the ones sticking their hands into the pots and creating magic with a little water and dye. 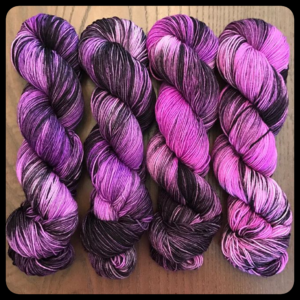 There is something magical about talking to a dyer and saying, “Can we put a little more pink in and darken the blue?” and then I see a pic and it’s exactly what I imagined. Their ability to manipulate colors is nothing short of spectacular. Most indie dyers also dye on a merino base (yes, there are lots of blends available, but the base is generally merino) and I just love me some merino yarn. It takes color so well and those deep saturated colors make me swoon. I dabbled in a little dyeing myself a couple years ago and it just wasn’t for me. Is it weird to say that I don’t have the patience to stand over a hot pot of water and go through the whole dye process? I mean, I do knit sweaters ONE STITCH AT A TIME like a crazy person! I guess there are just certain skills that I just don’t have the patience for. So I’ll leave it to the experts! 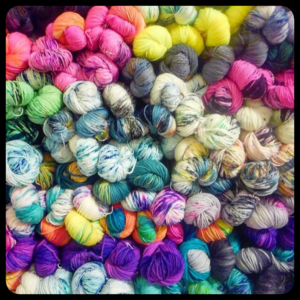 Scrolling through Instagram and looking at all the amazing pictures that my favorite indie dyers post is where I get my inspiration for designs. 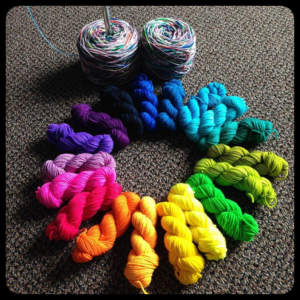 Sometimes I have a design in mind and then I search for the yarn that will make it happen…but most often, I see the yarn and then I start dreaming about what I could make with it. And by dreaming – I mean literally laying in bed at night, unable to sleep, thinking about yarn! There will be a lot of color blocking in KTRv1 because I like to use more than one colorway – not everyone can pull off a sweater knit entirely out of neon pink yarn! When I’m making my color decisions – I spend at least an hour looking at pictures of colors on my laptop and dragging them around next to each other to see what are the best options. It’s not about matching, it’s about complimenting each colorway. 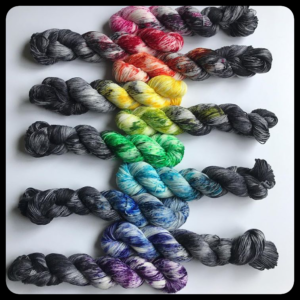 I can’t wait to get my needles into all the color I have planned and really hope that knitters find inspiration to invest in a full sweater out of amazingly dyed beautiful indie yarn! 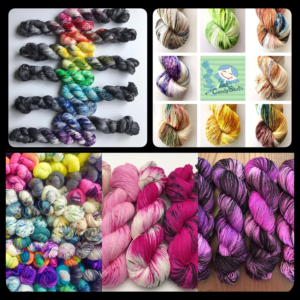 Have a favorite indie dyer? Comment below and be sure they are on my radar!